Wandering the 1057 booths at the 2008 INTERMOT Bike Show in Cologne, Germany, one of Motorcycle USA’s favorite exhibits was the Innovation Café. Featuring alternative two-wheeled designs, electric motorcycles and scooters were prominent. 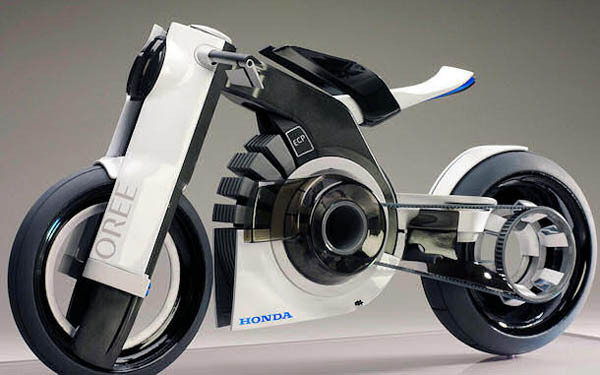 Yet there was one electric design that stood out in our minds, the Honda Oree. The minimalist design is fashioned around an electric motor, with radial battery packs placed around the circular edge of the powerplant – including the recharge plug. Citing the performance benefits of an electric motor, including high torque at low revs and quick acceleration, Look notes his design also does without a CVT gearbox or clutch. Instead power is transmitted directly via belt drive. The ambitious student design anticipates a motor producing 90-plus horsepower, 125 lb-ft of torque and top speed near 120 mph. Weight would be in the range of 290-375 lbs with a range of between 80-190 miles, depending on the number of batteries used. Of course, this is all speculative, as no such batteries or motor now exists (remember it’s a design college project!). Claiming inspiration from popular European naked bikes like the Kawasaki ER-6, the bare styling of the Oree sports a less-is-more gestalt (that’s German for design). Odd-shaped hand controls include hanging mirrors. A circular control display is located in a more conventional position, above the fork – the front houses the headlight assembly. Taillights are tucked under the scant seat. Chassis design features a single pivot point around the motor for the single-sided swingarm and final drive. Looking down in their stance, a rider will see the shock in action, as it’s placed between the frame’s backbone spars. Readers may remember the big Honda news at the 2008 INTERMOT Bike Show in Cologne was the unveiling of its V-Four concept bike. More akin to a sculpture than a functional ride, the wild-looking V-Four concept got top billing. Sure, the Oree is a scale model, but it looks like a more finished product and in pure creativity, the college kids may have bested Big Red at INTERMOT. As for the Oree’s non-scale-model future?